Description of "The Engineering of Reliable Embedded Systems"
The Second Edition of “The Engineering of Reliable Embedded Systems” (ERES2), documents an industry-proven approach to the development of software for reliable, real-time embedded systems, based on the use of ‘Time Triggered’ (TT) architectures. What distinguishes TT approaches is that it is possible to model the expected system behaviour precisely. This means that: [i] during the development process, it is possible to demonstrate that all of the requirements have been met; and [ii] at run time, problems can be detected very quickly. The end result is that we can have a high level of confidence that a TT system will either: [i] operate precisely as required; or [ii] react appropriately if a problem occurs. The above characteristics mean that appropriately-implemented TT systems provide a particularly effective means of meeting the requirements of various international safety standards, such as IEC 61508 and ISO 26262. Michael J. Pont was awarded a BSc degree (in Electronics and Electrical Engineering) by the University of Glasgow (UK) and a PhD (in Computer Science) by the University of Southampton (UK). He is the author of several previous books and more than 100 technical papers: he is named inventor / co-inventor on a number of patents and patent applications. Michael has been working in the field of time-triggered (TT) embedded systems for more than 20 years. He began this work in the academic sector, latterly as Professor of Embedded Systems Engineering at the University of Leicester (UK). Michael has helped numerous companies to create successful TT designs. Many of these systems have been produced in compliance with international safety standards and guidelines (including IEC 61508, ISO 26262 and DO-178). Michael currently serves as Executive Director of SafeTTy Systems Ltd (UK). 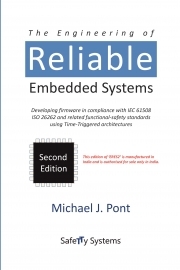 Reviews of "The Engineering of Reliable Embedded Systems"